Welcome to AccreditedInvestors.net. I want to talk about the Big Dogs. And by the way, that’s a brand name that I’ve given this one particular investor lead that I’ve been buying for about two, maybe three years now. What’s the Difference Between an “Accredited Investor” and a “Qualified Accredited Investor”? Unlike a private placement where the qualifications (according to the Security Exchange Commission) are that the investor makes at least $200,000 a year for the last two years or $300,000 combined income. Or a million net worth, not including their home, and experience in managing their personal portfolio. That’s just an “Accredited Investor.” The qualified accredited investor has a whole different set of rules. The SEC requires that A, he has at least a quarter million dollars liquid risk capital, and B, that he has $5 million in investable assets. And on top of that, to ask them one more question, “Have you got at least $5 million in investable assets?” It’s not easy. I mean, that by itself is almost a miracle, to have someone on the phone give up that kind of information. And they do. You know what, if you go to our testimonials, they happen to be…they were pitched with actually a deal. So it’s a pretty sweet deal. But if you look at the testimonials on this website, you’ll see that they’re not only closing on gas deals, but they’re closing on a diversity of deals. Hedge funds, they’re working for green deals, they’re working for art, they’re working for all kinds of different deals. The bottom line is it’s a dynamite lead. It’s got its own website, it’s www.bigdogs.tv. By the way, that middle dog is Yogi, that’s my little mini pin. And yeah, he is a big dog. He’s had about 13 puppies so far (or sired 13 puppies, so I consider him a big dog. If you have any questions, and you want to buy the best damn lead in the country ( and I’m not kidding), give me a call. I’ve been selling leadsfor a long time and I’m a damn closer. 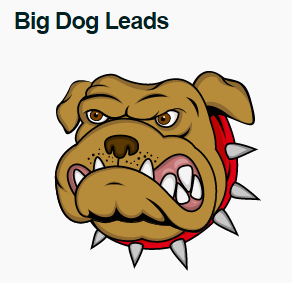 And believe me when I tell you, the big dogs are the best investor leads in the United States. But it’s a double edged sword. If you hand these accredited investor leads to your B team (or you hand them to a guy who doesn’t know what he’s doing), he’s going to eat them for dinner. These guys are not clowns, if your deal doesn’t hold water he’s going to do his due diligence, you better have the real deal. You better have it tight, and you better know what you’re doing when you try to close this guy. So if you’ve got any questions, call me. 561-981-8777. Have yourself a beautiful day, and God bless.